Kate’s graduate work built upon her clinical experience and focused on people with severe upper limb paresis after stroke. Here, she evaluated the use of novel training interventions (e.g., SMART Arm, outcome-triggered electrical stimulation), along with identifying clinical factors associated with functional recovery. 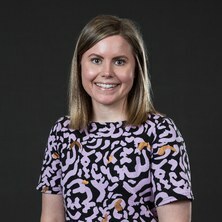 To extend on her graduate work in people with severe paresis, Kate is now using multimodal neuroimaging to explore the dynamic capacity of the severely damaged brain to identify possible brain-derived factors associated with functional recovery. Taken together, her research focuses on understanding how recovery occurs in individuals with severe upper limb impairment after stroke and the development of novel training interventions for these individuals. Journal Article: Is environmental enrichment ready for clinical application in human post-stroke rehabilitation? Hayward, Kathryn Susan (2012). The potential for stroke survivors with severe upper limb disability to improve in function during inpatient rehabilitation PhD Thesis, School of Health & Rehabilitation Sciences, The University of Queensland.